Dance Movement Psychotherapy acknowledges the connection between emotional, physical, cognitive, and social selves in mental health and wellbeing. Therapy sessions focus on embodiment and movement in a small group or 1:1 with a client-led approach. Through this modality, some of the aims are to be in the moment, tune into important and subtle bodily signals, and take a break from rumination. The sessions are not dance classes and there is very little, if any, 'follow my lead' movement instruction. Instead, movement is encouraged through a variety of facilitated processes. This can involve encouraging play, internal focused exploration, noticing felt sensations (such as tension, nerves, relaxation), and/or use of props. There is time to verbally consider experiences in the sessions and reflect on possible application outside of the therapy space. 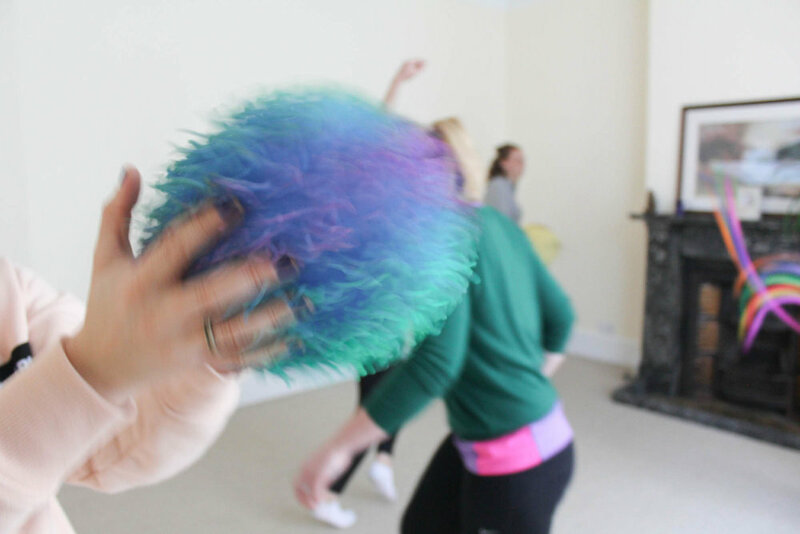 One of the aims of Dance Movement Psychotherapy is to help participants to reconnect to their body and understand the signals it gives. Whether through our experiences of busy lives and needing to ‘push through, or because of mental health struggles or trauma, bodily signals may end up being tuned out, or taking over. Being present in the body can be explained as being aware of your body and its position in relation to your surroundings and experiences. The benefits of this could mean feeling more secure within your body, and having a better ability to notice your own bodily triggers. This can often mean noticing your own emotions or unhelpful thought patterns earlier on, and using learned resources and coping mechanisms to respond to this. The creative, expressive space in a Dance Movement Psychotherapy session opens the possibility for participants to engage in metaphorical work, which in turn can allow for the opportunity to explore subconsciously held memories and beliefs and turn these over in a different way. Small changes and new experiences that are experienced within a session may lead to acknowledging larger changes the individual can make and new experiences they can tackle. I have previously delivered Dance Movement Psychotherapy groups in Mental Health Cafés, schools, and inpatient hospitals. I am currently working within the NHS.